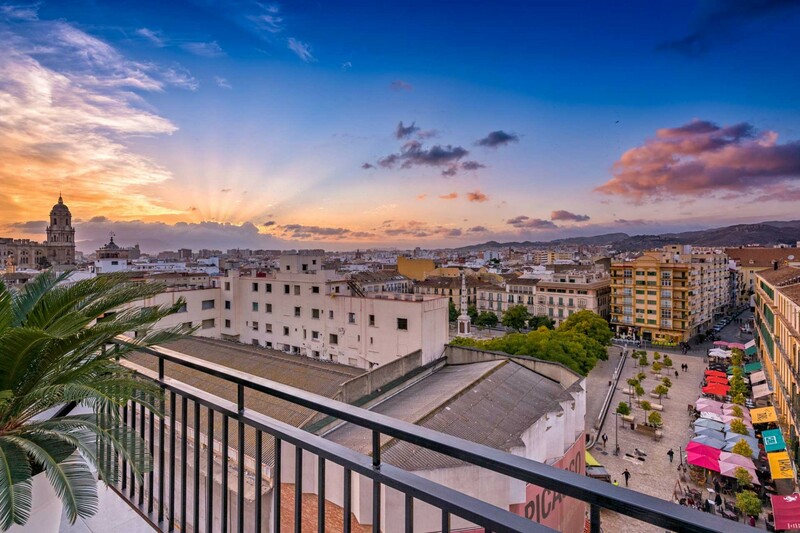 This luxury holiday penthouse in Malaga is located on the 7th floor with elevator. The apartment sleeps 4 people and offers two modern bedrooms, one with en-suite bathroom, free internet, Smart TV and a fantastic terrace from the living room offering sun most of the day. The accommodation in Malaga offers a unique opportunity to stay first class in the heart of the city with high quality furniture as well as modern and a practical design that makes your holiday perfect from check-in till check-out. This modern and stylish holiday apartment in Malaga city centre is set on one level with an additional upper rooftop terrace. The holiday apartment offers a large open-plan living and dining area with Smart TV, comfortable sofa, dining table and a modern open-plan kitchen with all accessories, bathroom, a double bedroom with fitted wardrobes and a second double bedroom with en-suite bathroom, shower and direct access to the charming terrace with outdoor dining table and a trendy outdoor lounge area. A staircase on the main terrace leads you up to an upper rooftop terrace with 4 sun loungers and stunning views of Malaga. The property has air conditioning in both bedrooms and in the living room. If you should need to park the car on your city break holiday, then we can offer secure parking 100m from the building for 15 € per day. 1 TV, TV Satellite (Languages: Spanish, English), 7rd floor, lift, garden furniture, 110 m² terrace, iron, internet (Wi-Fi), hair dryer, 100 m² property, air conditioning (hot/cold), air-conditioned, Garage in the adjoining building.